LOCATION.--Lat 40°55'03", long 74°39'51" referenced to North American Datum of 1983, Roxbury Township, Morris County, NJ, Hydrologic Unit 02040105, in gatehouse at left end of Lake Hopatcong Dam on Musconetcong River, 0.9 mi north of Landing, and 2.5 mi northeast of Netcong. PERIOD OF RECORD.--Continuous-record reservoir station, February 1887 to current year. REVISED RECORDS.--WDR NJ-82-2: Drainage area; WDR NJ-83-2: Corrections 1981 (M/m). GAGE.--Water-stage recorder 1928 to 1984 and water-stage recorder with telemetry 2004 to present year. Prior to June 24, 1928, and during 1985-2004, daily readings obtained by measuring from high-water mark to water surface converted to gage height, present datum. Datum of gage is 914.57 ft above National Geodetic Vertical Datum of 1929. COOPERATION.--From 1887-1928, data provided by Morris Canal employees; 1985-2004, data provided by Lake Hopatcong State Park. REMARKS.--Lake is formed by concrete spillway and earthfill dam completed about 1828. Crest of spillway was lowered 0.11 ft in 1925. Usable capacity, 7,459,000,000 gal between gage height -2.6 ft, sills of gates and 9.00 ft, crest of spillway. Flow regulated by four gates (3 by 5 ft), also by one 24-inch pipe with gate valve to recreation fountain 250 ft downstream from dam. Dead storage, about 8,117,000,000 gal. Figures given herein represent usable capacity. Data collected at 0700 on the first day of the following month between Jan. 1985 and Feb. 2004. Subsequent data collected at 2400 on the last day of each month. Lake used for recreation. Annual extremes beginning in water year 2014 can be obtained by using this link. Prior to water year 2014, annual extremes can be obtained on the respective annual water year summary. EXTREMES FOR PERIOD OF RECORD.--Maximum contents, 9,745,000,000 gal, Aug 13, 2000, gage height, 11.80 ft (level of Lake Hopatcong highest since dam was built in 1828); minimum contents, 1,525,000,000 gal, Dec 29, 1960, gage height, 0.65 ft. 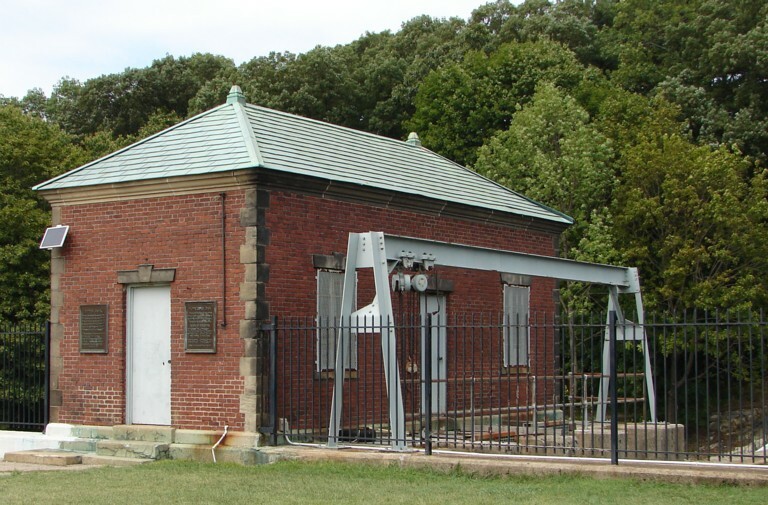 The gage height of the crest of the dam at Lake Hopatcong is 9.0 feet. NJ State Police high-water level is 9.5 feet. At lake levels above the high-water level, boat speeds are greatly restricted and no wakes are allowed. Streamflow data at the outlet of Lake Hopatcong are available at this link.